AHA Cards Jumped 772% in Price. Here's What CPR Trainers Need to Know. If you teach CPR and first aid under the AHA curriculum, you couldn’t miss the news—the price of cards and e-cards recently made a 772% jump—from about $2.20 to $17. This drastic price increase is likely to raise costs for instructors and training centers by thousands of dollars—and force them to raise the price of classes for students. The price change went into effect on October 3, 2017. It was announced suddenly—possibly to discourage organizations from buying up the cards in bulk at the cheaper rate before the new prices go into effect. Whatever the reason, however, the short notice gave schools, nonprofits, and instructors little time to prepare—and made the transition particularly problematic. Independent CPR instructors, as well as nonprofits, schools, and training organizations, often purchase cards and workbooks in bulk from organizations such as the AHA based on the number of students they anticipate having. They then set the price of their classes to offset the cost of materials. For many, inventory had already been purchased and budgets and contracts were already set when the price increase was announced, with no room to accommodate such an extreme increase in the cost of materials on such short notice. This means that independent instructors and organizations that usually support themselves by providing classes may now only break even under their current contracts—or pay thousands of dollars more than their income for classes. According to the AHA, the end goal of the pricing change was to encourage workbook sales. 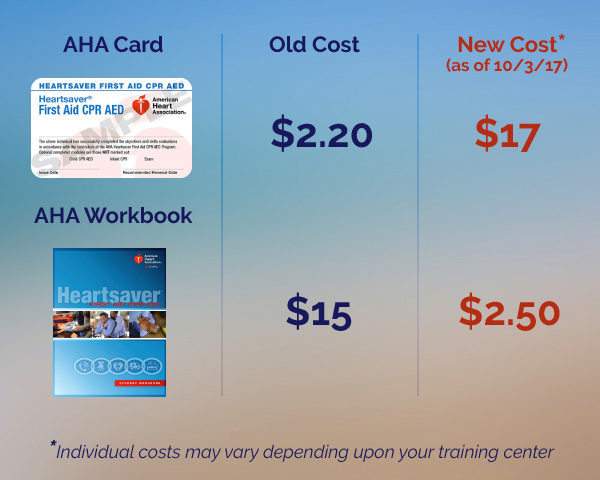 The AHA lowered the cost of its workbooks at the same time—from approximately $15 to $2.50. This price reduction was intended to offset the increase in card prices, while encouraging organizations to buy more workbooks. There is a problem with this working in practice, however. Many instructors deliberately reduce the price of their classes by buying fewer workbooks than they have students in order to keep class tuition low. Instead of buying one workbook per student, many organizations and instructors allow students to share—or make unofficial copies. And instructors have good reason to keep the cost of classes low. In many communities, competition for students is fierce and a large percentage of students are required by their employers to get certified. Students will go wherever the classes are cheapest. And in addition, a number of organizations and instructors feel an ethical imperative to keep class prices low in order to encourage as many people to sign up for lifesaving certification as possible. Not every student needs their own workbook in order to learn CPR and other lifesaving skills, but every student needs their own card. That means the price increase will hit both students and instructors hard, regardless of the price of workbooks. Shipping costs may significantly cut into the price reduction for workbooks as well. Under these conditions, instructors and organizations may have less money in their budgets to buy more workbooks, even with the reduced price. Needless to say, instructors and those who run CPR certification programs are very unhappy with this change. It will cost thousands in the short term. In the long term, in order to make up for the increased costs, many will have to increase prices to a level that isn’t competitive in the local market—risking losing business to other training centers that can keep their costs lower. The AHA itself recommends that instructors and program managers who are unhappy with the price increases should talk to their training center coordinators. The AHA assigns a training center coordinator to each account, and they will relay instructor concerns to the AHA. Instructors can also call the AHA directly at 1-888-AHA-8883 (1-888-242-8883). Callers have an opportunity to take a business survey at this number, and these surveys are tallied and discussed each week at the AHA. If enough people express their displeasure in the surveys, AHA employees will get a better sense of how the price increases are affecting instructors and program managers on the ground—and will take these concerns to the organization’s top management. That said, these actions may or may not have an effect down the line—but they are not a short-term solution. There’s one thing instructors and those who run certification programs can do right now to eliminate this problem—switch to a card and curriculum other than the one offered directly by the AHA. For many trainers, the AHA curriculum is non-negotiable because certain schools and nonprofits they work with will only accept this program. However, they do have some options when choosing where to get their cards and training materials. Online training programs that use the AHA curriculum are one of these options. High-quality online training is becoming more and more common across a variety of industries, due to its flexibility and cost-effectiveness. CPRCertified.com provides a nationally accepted certification and a curriculum developed by AHA-licensed CPR instructors. Our training program is compliant with ARC, ECC, ILCOR, and OSHA guidelines, and is based on the 2015 AHA curriculum. In addition, our cards are high-quality, made of PVC vinyl waterproof material, and are offered free of charge as part of our training program. Our pricing is all-inclusive and designed to be affordable to instructors and organizations operating on a budget and serving a very price-sensitive market. Like many of the clients we serve, our mission is to make affordable CPR training available to as many people as possible. The AHA’s new price increases don’t have to be a death knell to independent instructors and CPR training organizations. We offer a range of premium group video training options that can help organizations get their staff certified quickly and keep costs down across the board. If you are an instructor or training program coordinator facing steep price increases from the AHA, we invite you to get in touch with us. We’ll help you explore meaningful strategies to keep your costs down and your program running—while allowing you to maintain your commitment to providing low-cost certification to as many people as you can.